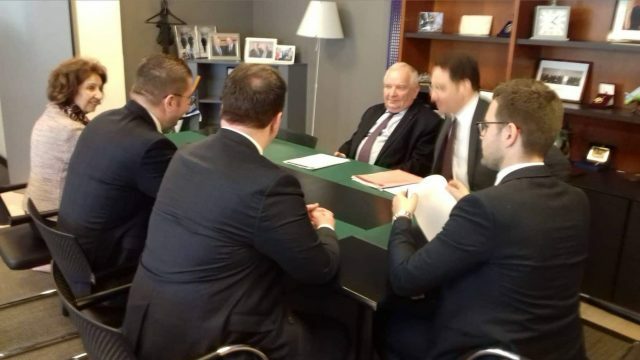 VMRO-DPMNE president Hristijan Mickoski together with presidential candidate Gordana Siljanovska Davkova, VMRO-DPMNE vice-president Aleksandar Nikoloski and the secretary for international cooperation Timco Mucunski are on a several-day working visit to Brussels. On Thursday, Mickoski, after the meetings he had, said that the past two days they had extremely important and useful meetings for VMRO-DPMNE, but also for the Republic of Macedonia, because they informed their interlocutors about the real situation in the Republic of Macedonia, about what is true reality for the Republic of Macedonia, and also for all citizens of the Republic of Macedonia. During Wednesday’s parliamentary assembly, I had very useful meetings with many presidents of our sister parties who are part of our family, from the family of the European People’s Party, I had several meetings with MEPs who are part of our sister parties within the European People’s Party, and we generally talked about the reality in the Republic of Macedonia, about the political persecution that is happening to political opponents, mostly opposition thinkers in the Republic of Macedonia. We talked about the lack of reforms in healthcare, education, and everything that practically represents failure of the government of Zoran Zaev and SDSM in the Republic of Macedonia. I also informed my interlocutors about the period ahead of us in terms of the presidential elections that, and I informed them about our strategy with just about a month until election day, about everything we do on the field, but also about the campaign which will officially begin on 1 April. Professor Gordana Siljanoska Davkova also had the opportunity to meet with many Presidents and MEPs from the ranks of the European People’s Party, to share her views, inform them about the program that she will present to the citizens in the Republic of Macedonia as future President of the Republic of Macedonia and all that represents a vision how should our country develop further. Today I also had a quality meeting with EPP’s President Daul. We talked about the developments within our European People’s Party, but I also informed him about the current political developments in the Republic of Macedonia, the violent behavior of the Government, the violent behavior of the institutions, practically a month before the voting in the presidential election. We talked about the political persecution, the lack of reforms in the Republic of Macedonia, but we also talked about the promise that the president of the government, Mr. Zoran Zaev, gave, that if his candidate loses in the presidential elections, he will call for early parliamentary elections in autumn. We take Mr Zoran Zaev at his word because we certainly believe that VMRO-DPMNE and professor Gordana Siljanovska will win the presidential election, and thus fulfill the only condition that Zoran Zaev has set himself, that is if he loses the presidential election to call for early parliamentary elections in autumn. Early parliamentary elections for the Republic of Macedonia will mean a new future, a real future, with real structural reforms, no fake news that are delivered here in Brussels within the European Commission, Mickoski said.